Aboriginal Deer Hunt, 1746. Public Domain via Wikimedia Commons. Thumbnail Image: Amis, Taiwanese aboriginal tribe, dance by takunawan via Wikimedia Commons. Licensed under the Creative Commons Attribution-Share Alike 3.0 Unported, 2.5 Generic, 2.0 Generic and 1.0 Generic license. In this week's episode, we discuss Warriors of the Rainbow, Wei Te-sheng's 2011 film about the 1930 Wushe Uprising in Taiwan. Both of Wei’s two films, Warriors of the Rainbow and Cape No. 7, explore legacies of Japanese culture and imperialism in Taiwan, which was a colony of the Empire of Japan from 1895 to 1945. For Warriors, the plot centers around a historical incident in 1930: the Wushe Rebellion. The Wushe Rebellion was an attack by the indigenous Taiwanese Seediq tribe on Japanese colonists when the whole settlement gathered for a sports day. There were 300 Seediq warriors who attacked the colony, and they combined forces with other tribes, making a total of 1,373 native people who were involved in uprising. By the end of the day, 134 Japanese were killed, out of 227 total colonists. 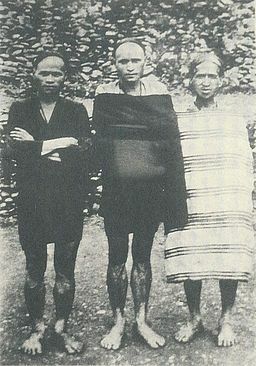 Seediq chief Mona Rudao and Seediq tribal leaders, pre-1930. Public Domain via Wikimedia Commons. We are joined in this episode by Dr. Leo Ching to help us discuss the movie, the importance of the Wushe Rebellion in the Taiwanese imagination, the island's long history of colonization, and the formation of contemporary Taiwanese identities. You can find this podcast on the iTunes store, SoundCloud, or listen to it below. Thanks for listening!